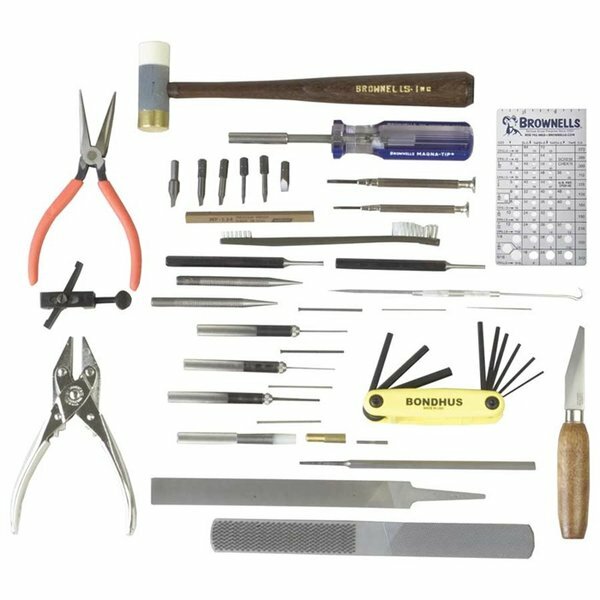 The 24 tools (plus 6 additional screwdriver bits) in this Kit are among the ones you will find on the work bench of practically all professional gunsmiths. When we chose each one individually, we walked the aisles of our stock room many times, repeatedly handling each of the vast variety of gunsmithing tools we carry. We had two thoughts in mind as we evaluated each tool: (1) If I were advising a good friend starting to work on guns, is this a tool he should have; and, (2) If I were assembling a compact, economical and basic service tool kit for myself, is this one of the tools I would start with. If the tool met both of these basic requirements, it is in the Kit.We feel that with the tools in this Kit you can confidently tackle the basic service, cleaning and repair jobs on practically any gun brought to you. The only exceptions would be where special tools are required for specific and complex, advanced procedures. For those jobs you can prepare yourself as you progress. But, this is the Kit you should start with.The Basic Gunsmithing Kit contains the following tools: No. 100 Parallel Pliers; 1" Nylon/Brass Hammer; No. 81 MAGNA-TIP® Screwdriver; Screwdriver Bits Nos. 1 - 2 - 6 - 00 - 10 - 20 and 30; Two sizes Instrument Screwdrivers; Main Spring Vise; MF134 India Stone; M-16 Brush; 1/8" x 6" Pin Punch; 5/32" x 6" Pin Punch; 1/16" Starter Punch; 3/32" Starter Punch; Brownells Replacement Pin-Punch Set; 2" Replacement Punch Assortment; Nylon/Brass Drift Pin Punch Set; Gunsmith Bench Knife; 8" No. 2 Cut Hand File; Sight Base File; 4-in-1 Hand Rasp; Scribe-Hook; No. 1033 6" Chain Nose Pliers; No. 91 Allen Wrench Set; Screw Check'r and Kit Box. Den 24 verktøy (pluss 6 ekstra skrutrekker biter) i dette settet er blant de finner du på arbeidsbenk gunsmiths praktisk talt alle profesjonelle. Når vi valgte hver enkelt individuelt, gikk vi aisles av rommet vårt lager mange ganger, gjentatte ganger håndtering hver stort utvalg av Børsemakerutstyr verktøy vi bærer. Vi hadde to tanker i tankene som vi vurdert hvert verktøy: (1) hvis jeg var rådgivning en god venn igangsetting å arbeide med våpen, er dette verktøy han burde ha; og (2) hvis jeg var montering en kompakt, økonomisk og grunnleggende tjenesten verktøysett for meg selv, er dette en av verktøyene jeg skulle starte med. Hvis verktøyet møtte begge disse grunnleggende kravene, er det i Kit.We føler med verktøyene i dette settet du kan trygt håndtere grunnleggende tjenesten, rengjøring og reparere jobber på praktisk talt alle pistol brakt til deg. Det eneste unntaket vil være der spesialverktøy kreves for spesifikke og komplekse, avanserte prosedyrer. For de jobbene kan du forberede deg som du avanserer. Men dette settet du bør starte. Den grunnleggende Gunsmithing Kit inneholder følgende verktøy: nei 100 parallelle tang; 1" nylon/messing Hammer; Nr 81 MAGNA-TIP ® skrutrekker; Skrutrekker biter nr. 1-2 - 6 - 00 - 10-20 og 30; To størrelser Instrument skrutrekkere; Main våren Vise; MF134 India Stone; M-16 pensel; 1/8 "x 6" Pin Punch; 5/32 "x 6" Pin Punch; 1/16" starter Punch; 3/32" starter Punch; Brownells erstatning Pin-Punch sett; 2" erstatning Punch utvalg; Nylon/messing Drift Pin Punch sett; Børsemaker benk kniv; 8" nr kuttet hånden fil. Synet Base filen. 4-i-1 hånden Rasp; Scribe-krok; Nei 1033 6" kjeden nebbtangen; Nei 91 Allen fastnøkkel sett; Skru Check'r og Kit-boksen. I bought one of these maybe 5 years ago. I am cheap so I thought at the time about trying to put something together piece by piece and see if I could save a buck. Glad I bought it, very well thought out selection of quality tools that has really been handy. Mine came with a plastic box and a sorting tray (stuff you can get cheap locally) that I do not see in the picture.